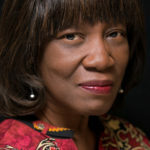 Patricia Smith is the author of seven critically-acknowledged volumes of poetry, including Incendiary Arts, winner of the 2017 NAACP Image Award for Outstanding Literary Work in Poetry; Shoulda Been Jimi Savannah, winner of the Bobbitt National Prize for Poetry from the Library of Congress, the 2013 Lenore Marshall Poetry Prize from the Academy American Poets, and a finalist for the William Carlos Williams Award from the Poetry Society of America; Blood Dazzler, a National Book Award finalist; Teahouse of the Almighty, a National Poetry Series winner (all from Coffee House Press); Close to Death and Big Towns, Big Talk (both from Zoland Books), and Life According to Motown, a special 20th anniversary edition (Tia Chucha Press). She also edited the crime fiction anthology Staten Island Noir. Her contribution to that anthology, the story “When They Are Done With Us,” won an award from Mystery Writers of America and was published in Best American Mystery Stories. She is a Cave Canem faculty member, a professor of English at CUNY/College of Staten Island and a faculty member of the Sierra Nevada MFA program.